Inline Embellishment. Decorating and Finishing with Hybrid. The label printing industry is expanding as new technologies support shorter runs and added-value products. In addition to traditional flexographic solutions, digital print—both electrophotographic and inkjet-based solutions—are available. Also, hybrid solutions, which include a combination of flexographic, digital, and/or finishing capabilities are on the market. Based in Southern CA, Adcraft labels was founded in 1977. The company is a second-generation, family-run operation that manufactures custom labels, tags, and flexible packaging. The company is dedicated to building its client brands through is abilities in design, color management, and production. Adcraft began its search for digital printing technologies in 2012. Looking to set themselves apart from the competition, the search began for a unique digital solution to complement its flexographic background. Ideally, something that enabled embellishments with the flexibility of digital. Enter the Mark Andy Digital Series press. The series of presses offer decorative potential and speeds of up to 240 feet per minute. 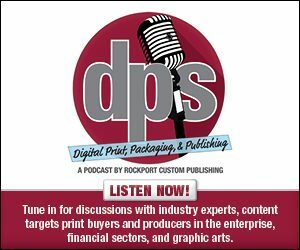 An inline process supports digital print, converting, and finishing within a single production run. Mark Andy’s production-class digital solution is designed to bring productivity and profitability to the modern label converter. Digital Series HD combines high-resolution digital print and best-in-class production capability into a single-pass workflow. Adcraft’s Digital Series configuration also features the label provider’s proprietary JetFlex Technology, which enables cold foil before the digital print engine, as well as five multi-purpose flexographic stations to support spot colors, primers, adhesives, laminates, and varnishes. Decoration is also supported digitally through Color Logic special effects software, which is certified on the Mark Andy Digital Series. Adcraft’s JetFlex Technology workflow is based on the Mark Andy Digital Series platform and allows customers to do more than they could ever afford before. With it, the label provider is able to produce a label using flexographic features like custom colors and tinted foils, then change—on the fly—all of the CMYK plus white graphics. Clients have access to an improved, embellished label that also eliminates plate and screen costs. Digital capabilities like variable data are also available. According to the label provider, the digital capabilities of JetFlex Technology offer the ability to personalize packaging while maintaining brand consistency across a number of product lines. The technology uses true Pantone colors and enables the inclusion of digital information on each label. Adcraft’s JetFlex Technology ink system is durable, in many cases varnish and laminates can be eliminated, according to the company. The inks also have a texture and thickness that gives a tactile effect without varnish. The digital opaque white ink is designed to rival that produced by screen printing and provides brand owners the ability to use multiple colors on a clear label. The company’s hybrid device is also equipped with a Quick Change Die Cut module, which allows for fast changeover between jobs and increased productivity. According to a published case study on Adcraft by Mark Andy, in one year with the hybrid Mark Andy Digital Series, the company has gained 40 new customers—19 percent of which utilize the Digital Series press, equating to 353 recurring orders produced on the hybrid platform. Hybrid printing solutions bring two or more technologies together for a unique solution with complimentary capabilities. Adcraft is able to offer high-end decorations typically associated with flexographic technologies with the benefits of digital production for its label customers.